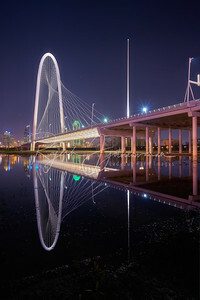 In the most recent years, The Margaret Hunt Hill Bridge has become an icon of Dallas, Texas replacing the Reunion Tower that identified the Dallas skyline. 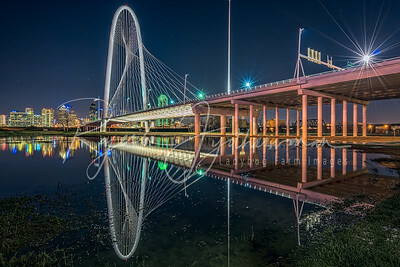 Fondly called Big Marge, this bridge in Dallas spans the Trinity River and designed by Spanish neofuturistic architect, structural engineer, sculptor and painter Calatrava. The bridge is named for Margaret Hunt Hill, an heiress and philanthropist. A reprocessed image originally shot over a year ago. 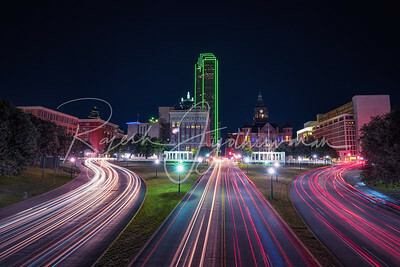 This Long Exposure of the traffic flowing in and out of downtown Dallas on Interstate Hwy 30, was shot on a vintage 1960s Minolta lens. 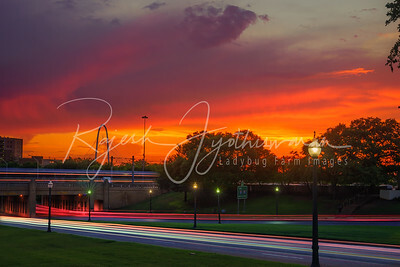 Traffic light trails in Dallas, TX at the Dealey Plaza where President Kennedy was tragically assassinated. I shot this picture in October 2016 when I went downtown with my artist friend Renata Sharman and my family. "The Ball" aka Reunion Tower was lit in pink perhaps to mark Breast Cancer Awareness program called "The Power of Pink". 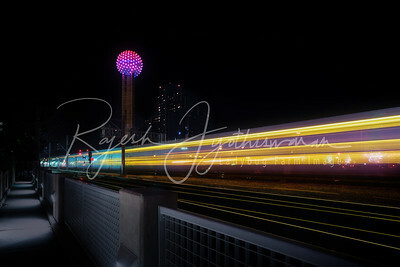 Even if I am wrong about the details here, Reunion Tower looked great as usual as a Trinity Railway Express train breezed by. If you are a female, please talk to your doctor if you need a mammogram. If you are a guy, please remind your mom, sister, spouse or significant other if they are 40 years old or more to get a mammogram. This 'Weekend of Honor' City of Dallas remembers the sacrifice of five police officers who were brutally murdered by a domestic terrorist a year ago. 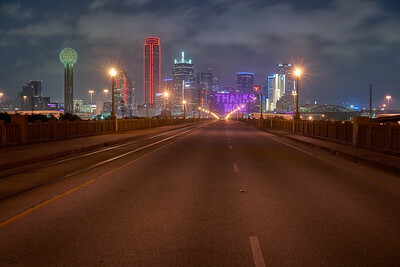 This evening, the downtown skyline was blue with practically every building lit up in blue the color of the Dallas PD. However in the direction away from the downtown I witnessed this flaming sunset. With me was my new partner in crime, my nephew Harish. The last time I took him around, I found a beautiful swath of native wildflowers with the skyline as the backdrop and now, this. His reaction to this scene was, "I had never seen such colors in the sky". Hope he is back next year at UT Austin so we can shoot some more of these. PS: Does anyone know why Lee Harvey Oswald shot JFK? Was he the only shooter? 'Big Marge' aka The Margaret Hunt Hill Bridge is the redefining symbol of the ever changing skyline of Big D. A very unique architectural creation by Spanish architect Santiago Calatrava, Big Marge and her little Sister, the Margaret McDermott Bridge are fast becoming the Dallas, Texas landmarks much like the iconic Reunion Tower and the Pickle. I shot this picture in late February 2016 when the Trinity River flooded providing this beautiful reflection of the landmark with Downtown Dallas in the background. A horizontal /landscape orientation picture taken by me has been my most successful stock photo. I hope this one will beat it since this would be perfect on magazine covers, shower curtains, blankets, bedsheets, brochures, business reports, proposals and, wedding invitations if someone proposed here and that happens often I am told. 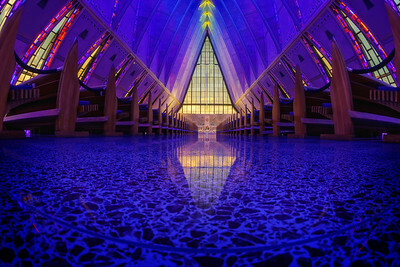 Majlis Oman, the new parliament building, is the latest of landmark buildings in Muscat. The building comes as a testimony to the Sultan’s vision of establishing a modern democratic state built on grounded Islamic routes where the people of the land are an integral part of the decision-making authorities in the country. The symbolic significance of this project cannot be overstated. The Majlis is at the very heart of Oman’s constitutional power and is the only legislative body in Oman where all members are democratically elected. The building is located in the prestigious Al Bustan area of Oman close to the Ceremonial Palace and Ministerial buildings. 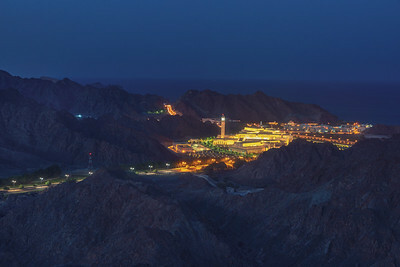 The new Majlis overlooks the Gulf of Oman and is surrounded by a mountainous background and primary dual carriageways. The building’s design has a number of elements that are based upon elements from the numerous early forts located throughout Oman. This building both respects the origins and takes from it, and also adapts into a modern Omani style showing the forward looking intents of the government. The Frommer's travel guide describes the Golden Gate Bridge as "possibly the most beautiful, certainly the most photographed, bridge in the world.”. This timeless beauty turned 80 years old last May. She is what Lady Liberty is to people in New York, Eiffel Tower to Parisians and the Sydney Opera House down under. On a recent trip to the bay area to visit family, I dragged myself out to this place by myself on a Saturday morning hoping for a decent sunrise. I am glad I did that because the sunrise the following morning was lukewarm at best. 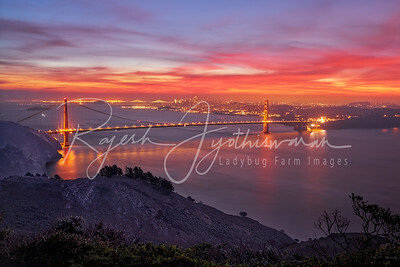 I made this image as San Francisco started to awaken from slumber and the Sun was about to pop on the horizon. A city that perhaps never sleeps, its lights shone bright and cars made their way across on the 1 mile long bridge. A few moments later, the lights on the International Orange colored Golden Gate Bridge were gone as sunlight gradually took over. 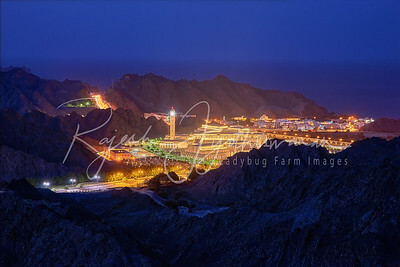 The full name of this magnificent structure is the Sultan Qaboos Grand Mosque, which dominates the Muscat skyline. 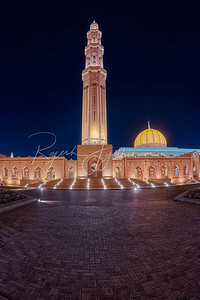 The mosque used to have the world’s largest carpet and chandelier, but Emiratis and Qataris came to measure the interior and made bigger versions in new mosques to steal the title, according to a blog post. Lonely Planet says, the Persian carpet alone measures 70m by 60m wide, making it the second-largest hand-loomed Iranian carpet in the world; it took 600 women four years to weave. The mosque can accommodate 20,000 worshippers though at the time I visited, there were only a handful of people around. I missed seeing the beautiful interiors. A lot of folks familiar with the 1987 Oscar winning American cyberpunk action film, RoboCop might know that the movie is set in a dystopian Detroit, Michigan, on the verge of total collapse due to financial ruin and a high crime rate. Many folks however do not know that although RoboCop is set in Detroit, Michigan, many of the urban settings in the film were actually filmed in Dallas, Texas. The futuristic appearances of the Dallas buildings, such as Reunion Tower, are visible in the background during the car chase. The front of Dallas City Hall was used as the exterior for the fictional mega-corporation, OCP’s Headquarters. The real Detroit only appears in stock footage during the film’s opening. The 1999 cult classic and comedy, ‘Office Space’ is set and shot in the Dallas area and you will hear references to Las Colinas and other places in Dallas. Oliver Stone’s Born on the Fourth of July was also shot in and around Dallas with college scenes set in Syracuse actually shot on the the campus of Southern Methodist University (SMU) About this picture, I shot it three weeks ago when the Trinity River flooded and the pre-dawn flood waters reflected the skyline as a few stubborn stars in the sky vainly resisted the onslaught of the rising sun. 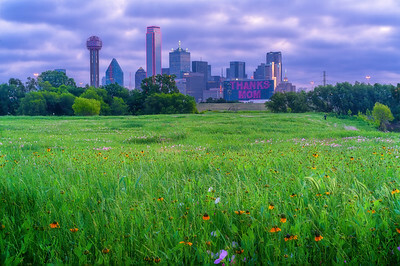 Last year in early May I was showing my nephew some sights around Dallas when I stumbled upon an impressive stand of Clasping Coneflowers on the Trinity riverbed with the the Dallas skyline in the background. I wanted to go back and look for more wildflowers this year and for two early weekend mornings I did just that with some friends. I was truly amazed at the diversity of native wildflowers their beauty. I am not a botanist by any means but even I could identify several of them. Okay, I sort of lied. My first passion was Gardening with Native Plants and before the camera bug bit me, I knew more about plants than I know about photography now. This time, I found large colonies of Clasping Coneflowers (Dracopis amplexicaulis), Mexican Hats or Prairie Coneflowers (Ratibida columnifera) in different colors, and blankets of Pink evening primrose or buttercups (Oenothera speciosa) other native wildflowers and grasses. 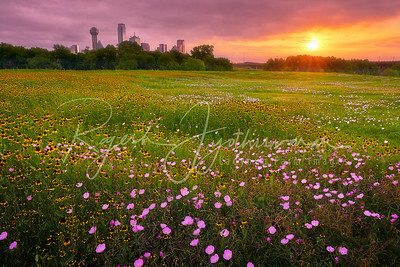 The much anticipated colorful sunrise fell apart quickly and soon it started to rain. I had positioned myself to catch the first rays of sun to pierce the clouds and had a few good minutes to capture this image. Yeah I already posted one for the day but once is not enough to Thank your Mom. So here is it yet again at 5:30am this morning. Thanks to Mothers everywhere for the sacrifices they make day in and day out. It is cliched but it is indeed a Thankless Job. A day on the calendar does not suffice for what moms do for their children. 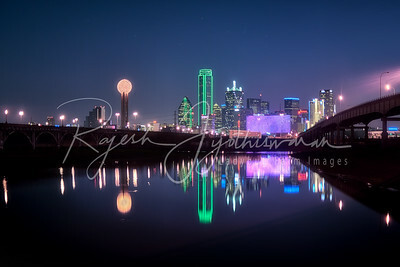 I shot this picture this morning as the Dallas skyline reflected a thankful city and community. I met a friend for the first time. Mital Patel is a phenomenal photographer and I was honored to have his company. You can see him in the far right side hunting for compositions. Please feel free to share this image with your friends especially those mothers in your life. 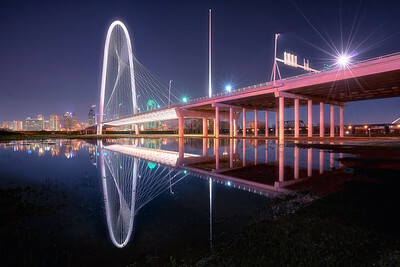 The Dallas neo-icon, Margaret Hunt Hill Bridge aka Big Marge in all her flooded glory. A reprocessed image originally shot over a year ago. 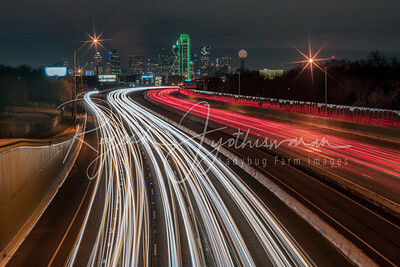 This Long Exposure of the traffic flowing in and out of downtown Dallas on Interstate Hwy 30, was shot on a vintage 1960s Minolta lens.